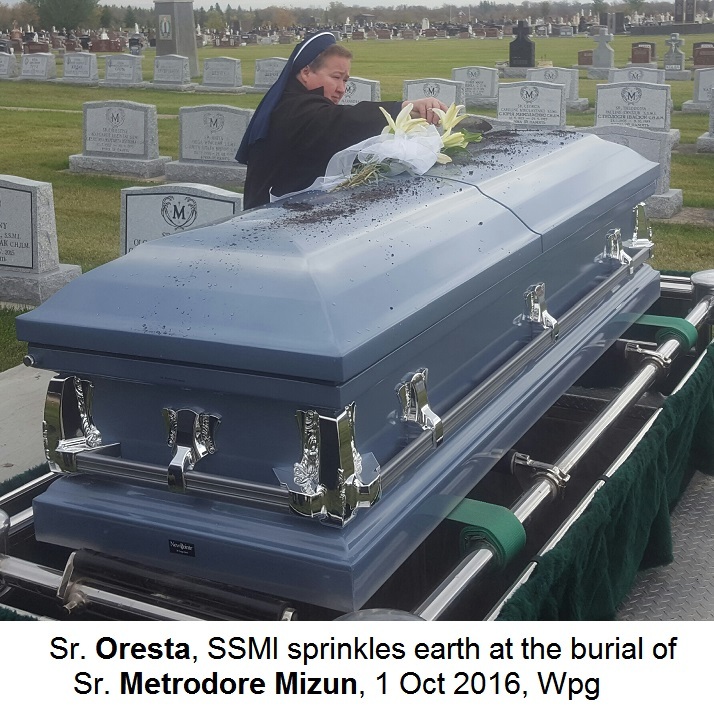 Sister Metrodore Mizun, SSMI in her 95th year of life was taken to the Lord on the 25th of September 2016. 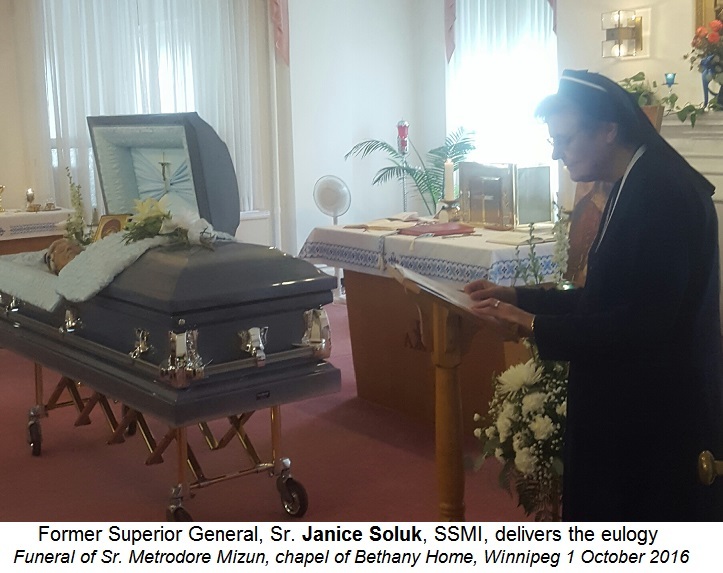 Her funeral services were held at the chapel of Bethany Home - the main Manitoba residence of the Sisters Servants of Mary Immaculate in Winnipeg. Many of her religious sisters gathered for the funeral, including the order’s general superior from Rome, Sr. Theresa Slota. Two other former general superiors were present and one, Sr. Janice Soluk delivered the eulogy following the Divine Liturgy. The late Sister Metrodore’s many friends from Windsor Ontario, where she served some 35 years before being transferred to Dauphin and then Winnipeg, were represented by a protégé Michael Paul who spoke with great emotion about Sister’s influence on his life. Metropolitan Lawrence was in Dauphin, Manitoba for the centenary celebrations of the parish there, so the main celebrant at the funeral was Fr. Bohdan Lukie, CSsR a former long-time chaplain to Holy Family Home where Sr. Metrodore spent her last months. Concelebrating were Monsignor Michael Buyachok and Fr. Isidore Dziadyk, SOBM. Also in attendance were Fr. Michael Kwiatkowski and Deacon Victor Humniski. Interment took place at the Sisters Servants section at Holy Family Cemetery. Зі святими упокой, Христе, душу померлої раби Твоєї, монахині Сестри Метродори, де немає ні хвороби, ні журби, ні смутку, а життя безкінечне. Бо Ти єси воскресіння, життя і вічний спокій, Христе Боже наш, і Тебе славимо з Предвічним Отцем і Святим Духом нині і повсякчас, і на віки віків. Амінь. Sister Metrodore died peacefully at Holy Family Home on September 25, 2016, with her nieces Margaret and Ellen and her community of Sisters present. She was in her 95th year and 78th as a Sister Servant of Mary Immaculate. Sister Metrodore (Anne) was born in Toronto on November 21, 1921. Her parents, Leon and Magdelene (Drociuk), a deeply religious couple, emigrated from Western Ukraine in 1913. They settled in Toronto and in 1930 moved to Cooksville, now Mississauga. Anne, entered the Novitiate of the Sisters Servants of Mary Immaculate on July 28, 1938 and took the religious name of Metrodore. She was preceded in 1925 by her sister Stephanie (Sister Naucratia), who died at an early age in 1930. Sister Metrodore’s youngest sister Nadia, followed her into religious life in 1942, becoming Sister Genevieve. Sister Metrodore taught religion and conducted Ukrainian School in Saskatoon and Toronto. She taught kindergarten at St. Anne’s School in Ancaster. Music was a big part of Sister Metrodore’s soul. While in Toronto, she studied music at the Toronto Conservatory and in private studios in Saskatoon, Windsor and Detroit. She took courses in choral and orchestration. She also took choral conducting sponsored by the Ukrainian Canadian Committee. She opened a School of Music in Windsor and taught piano and music theory for 54 years. She helped students reach their potential, giving them guidance, valued advice, hope, inspiration and encouragement. Connections with these students remained long after they graduated from the School of Music, some till her passing. While in Windsor, she served the parish of Saints Vladimir and Olga Ukrainian Catholic Church, teaching religion and Ukrainian, directing youth and children’s choirs, cantoring and leading a prayer group. She was warm, caring and compassionate to those suffering, always available to anyone in need. She was especially grateful for her year of spiritual renewal at Gonzaga University in Spokane, WA. and her opportunities to travel to other countries. Sister Metrodore was devoted to her family and grateful for the faith of her parents. She reached out to her siblings and relatives in all circumstances of life. In 2006, Sister left Windsor and was missioned to St. Paul’s Home in Dauphin. Here she appreciated making new friends and open to ministry of availability and contemplative prayer. In 2008, the Dauphin parish celebrated her 70th Jubilee as a Sister Servant. In 2015, Sister Metrodore became part of Holy Family Home. As a resident she continued her ministry of encouragement and prayer. She valued the warm welcome and excellent care she received. All the Sisters are all grateful for the compassionate care that was provided by the 2A Staff - Sacred Heart Unit, Drs. Peter Connelly, Taras Babick and Andrea Babick, all the Clergy, Sisters, Associates and friends who took time by her bedside over the last few weeks. Gratefulness for the Seven Oaks Hospital Staff on her time there. Heartfelt gratefulness to the Windsor parish who reached out to her through phone, letters and many prayers – especially Fr. Eugene, Michael and Garry. Sister Metrodore was predeceased by her parents, Magdalene and Leon, brothers Jaroslaw, Athanasius, sister Anastasia, and a second brother Athanasius, all of whom died in infancy; her sisters Stephanie (Sister Naucratia), Mary, brothers Joseph (Irene) and Walter (Toledo). She is survived by Sister, Genevieve (Nadia) SSMI, Yorkton, SK, nephew John, nieces Marie, Margaret and Ellen (Chris) and their families. Funeral Services will be held Saturday, October 1 at Bethany Home Chapel, 131 Aberdeen Ave. Viewing at 10:30, service at 11:00. Charitable donations in her memory may be made to Holy Family Home - Lubov Foundation.